Mrs. Eunice Tiffany Wilson's Funeral Will Take Place To-day. Mrs. Eunice Tiffany Wilson, who passed away Tuesday night, was a resident of Detroit city for upwards of a half a century. She was a pensioned civil war army nurse, and the widow of Lieut. Harry J. Wilson, a veteran officer of the Mexican war, to whom she was married in 1855, by the late Rt. Rev. Bishop McCoskry in this city. 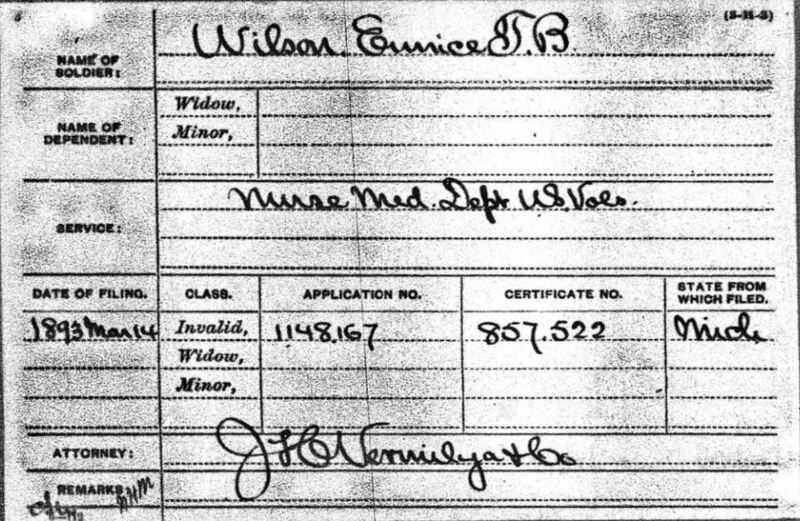 Mrs. Wilson passed away at the residence, 414 Second avenue, after a prolonged illness. She was a lady of intellectual refinement, artistic tastes, a careful reader of the higher class of literature, with a personality that drew to her a host of life long friends. Mrs. Wilson leaves no children or relatives save a niece, Mrs. John Walbridge of Toledo. She will be buried by the side of her husband in Elmwood cemetery, services being held at the house this afternoon at 3 o'clock. Interment will be private. The funeral of Mrs. Eunice T. Wilson, civil war army nurse, took place yesterday afternoon at the residence, 414 Second avenue, Rev. Charles E. Woodcock, rector of St. John's Episcopal church, and Assistant Rector Wood, officiating at the house and at grave in Elmwood Cemetery. Mrs. Fannie D. Joslyn sang. Rev. Dr. Woodcock, by request of Mrs. Wilson, made to a friend several days before her demise, read the poem of Tennyson entitled "Crossing the Bar". The pallbearers were John T. Shaw, Harvey C. Clark, Henry M. Wright, J. S. Farrand, George Swift and Herbert W. Mann.